For weeks now, I’ve seen lots of blog posts about the new product line of Belo: the Belo Baby. I’ve also seen the advertisement of the cutie and adorable Scarlet Snow and I think she’s really lovely! I didn’t know Dr. Hayden and Dr. Belo had a baby already until recently. I’ve been wanting to avail of the Belo Baby products so Nate can try them out which was why I joined a giveaway, hoping Nate could also try the products for free. The giveaway announcement doesn’t happen until next week but luckily, Sample Room has the Belo Baby products already and I was able to avail of the Belo Baby Cologne using my Sample Room points. Cool Drizzle is one of the 3 Belo Baby fragrances. I got the product last week along with 2 other items that I ordered from Sample Room. Nate was able to try this it out right away. 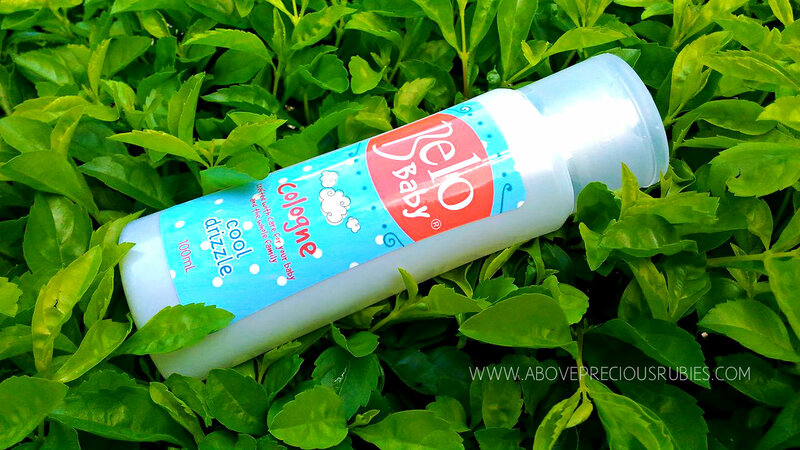 Belo Baby colognes are introduced as clinically proven gentle and less irritating for the skin. I love anything with the touch of blue, I don’t know why but color blue just refreshes my sight! It reminds me of the skies, the breeze, winter, the sea. Anything that seems cool and refreshing! This is the main reason why I chose to try this product first than the other 2 other fragrances I found in Sample Room, because I like the color. The sticker on it is designed in a very simple and cute way, you can clearly see, just at a glance, that their products are for the little ones. Belo Baby cologne is at P 79.75 SRP for 100 ml. I think that the price is reasonable, di nakakabutas ng bulsa for something you can carry everywhere with a classic scent for your child. The most important thing for this product is the smell. I have to be honest, when I first smelled it, I didn’t like it! Mejo matapang sya sa ilong, sa totoo lang. So I was like, “no, I don’t like this one”. But I let it stay on my skin and let it dry. After about 10-15 mins, I checked to see if the smell was still there, and to my surprise, the initial fragrance I smelled was no longer there! It was replaced with a good smell that I really like! There are many colognes like this, right? Those that seem to have a really strong smell at first but it becomes great smelling the longer it stays on you – that’s what this product is for me. Since it’s a cologne, you can’t really rely on it to stay long. So, as expected, the smell was gone after about 2-3 hrs, but I believe that still depends upon your child’s activity, if he’s too active, it could be gone a little sooner. However, this product is good to add in our baby/toddler bag, it’s not bulky at all. – A product with glycerin that moisturizes and a chamomile-derived ingredient that soothes skin. – Absolutely free of parabens, phthalates and coloring agents. – Hypoallergenic. Dermatologist-tested. Perfect for all skin types. This is very important for parents like me, specially for those with kids who have sensitive skin. We want them away from products that can harm their skin, or worst, cause allergy to our kids. I’m fortunate that Nate doesn’t have allergy but for those kids with sensitive skin, this can be a good product to try. Would I buy or recommend this product? Of course, I would! This is a good product for me and I think that it’s great for Nate, so we’ll definitely ordering for more of this. Moms like me, have you tried this out yet? What can you say about this product? I’d love to hear from you! You should try the other scents!! Super bango. This looks like a great product from Belo. Will try to introduce this one to my sister. You might like it too sis, ito pinakasikat ngayon, grabe ang gastos nila sa advertising. haha.